The west side of the San Gabriel Mountains offers fewer trails than the rest of the range, but it is home to one terrific waterfall. This four-mile round trip hike on Trail Canyon Trail tackles 700 feet of elevation gain to reach a sublime 30-foot waterfall. 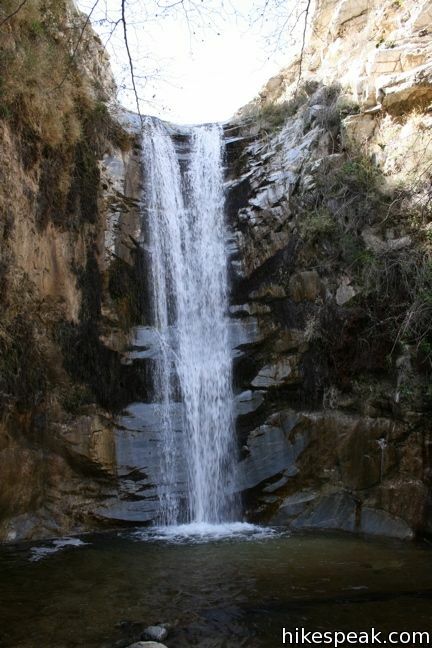 Trail Canyon Falls is one of the Los Angeles waterfall hikes. Approach this waterfall via Trail Canyon Trail (a trail so good they named it twice). After 2/3 of a mile walking past cabins along a dirt road, proceed onto a single track trail. Take this trail and follow Golden Creek up a canyon shaded with alders and sycamores. 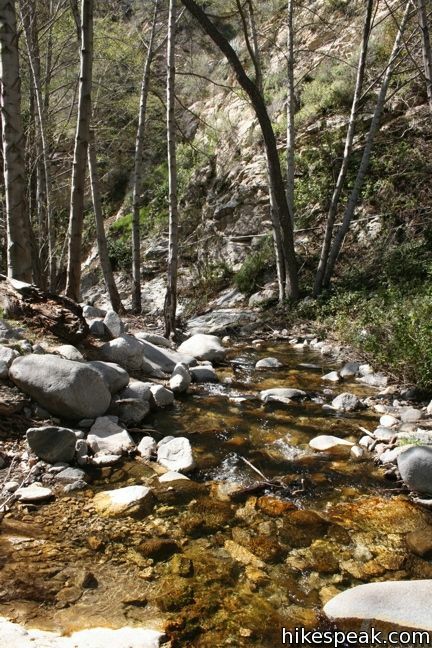 The trail crosses the stream a few times before climbing the wall of Big Tujunga Canyon. Glimpses of Trail Canyon Falls can be seen ahead. This area was badly burned by the 2009 Station Fire, which likely cleared away vegetation to increase visibility of the waterfall. You can also enjoy broad views of the canyon and the mountains above. The trail makes its way around the side of the canyon, rising to an elevation close to 2,500 feet. Trail Canyon Trail levels out as it approaches a large granite landing above the falls. This is a great spot to stop for a snack and enjoy the creek. 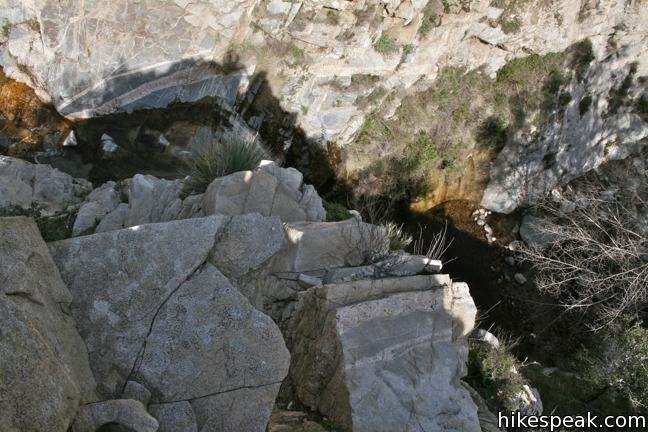 The trail reaches pools in the creek above Trail Canyon Falls and you can walk down the granite to the brink of the waterfall. Trail Canyon Trail proceeds up the canyon from the waterfall to Tom Lucas Trail Camp. The brink of Trail Canyon Falls is 1.9 miles from the trailhead and offers a reasonable spot to tunr around. For a closer view of Trail Canyon Falls, backtrack a tenth of a mile along the trail to a footpath that leads down into the canyon. The path descends a steep bank of dirt through brush, and may require agility and shoes with good traction. In fact, this path may completely unsafe due to fire damage and loose, steep terrain, so use discretion. If you make it down to the canyon floor, you will be greeted with an outstanding view of Trail Canyon Falls. The 30-foot waterfall spills over a smooth wall into a shallow pool. 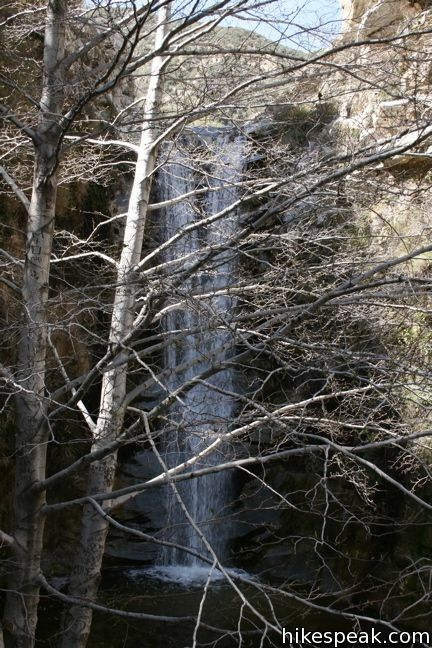 In winter or early spring, when rain water fills the creek, the waterfall is quite impressive. Considering the effort it will take to get back up the trail, break for a moment and enjoy. An alternative return route is to bushwhack and rock-hop down the creek to get back to the trail. Dogs are welcome on Trail Canyon Trail. It is free to park at the trailhead (a National Forest Adventure Pass is no longer required). 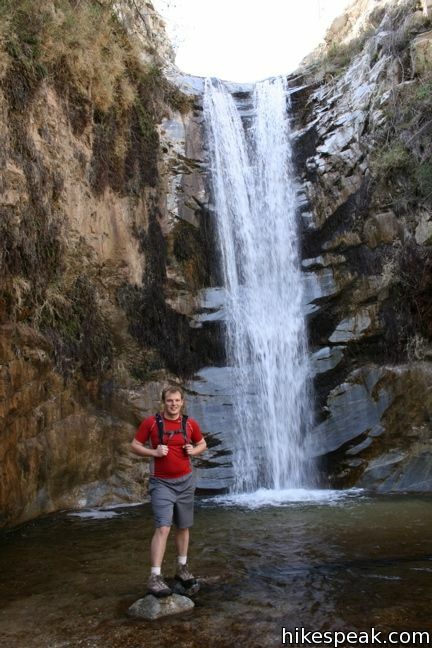 No permit is needed to hike to Trail Canyon Falls in the San Gabriel Mountains, so get out and enjoy! The 2009 Station fire scorched the areas surrounding Trail Canyon Trail, resulting in a long-term trail closure. Look for signs of natures rebounding renewal. To get to the trailhead: From the 210 Freeway in Sunland, between Pasadena and the junction of the 5 and 405 Freeways, head north on Sunland Boulevard until it becomes Foothill Boulevard. After another mile, turn left on Mount Gleason Avenue. One and a third miles later, make a right on Big Tujunga Canyon Road. After 3.4 miles, turn left up the hard-to-spot Trail Canyon Road. (a sign for Trail Canyon Trail is visible from the opposite direction). Follow this road for 0.4 miles to a large parking lot where the hike begins (bear right at one intersection along the road to descend into the canyon). You may discover a closed gate at the bottom of Trail Canyon Road. 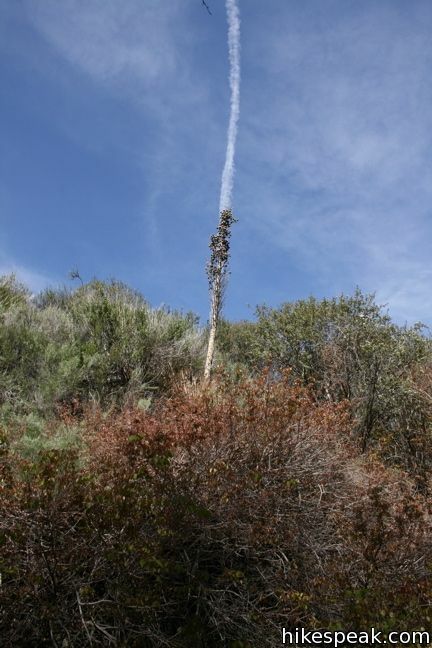 If so, park at the bottom of Big Tujunga Canyon Road and walk 0.4 miles up to the trailhead. These photos were taking in March of 2008, prior to the Station Fire, which closed the trail for two and a half years. Click to enlarge. This 7.5-mile round trip hike on the north side of the Verdugo Mountains ascends from La Tuna Canyon to the highest summit in the range. 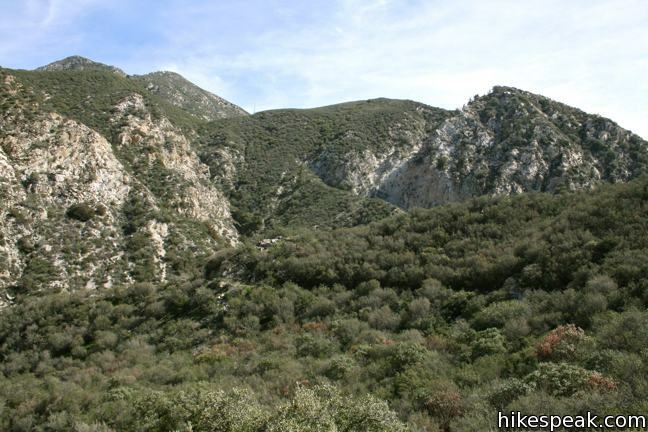 This 4.5-mile round trip hike ascends a ridge and a pair of canyons in La Tuna Canyon Park on the northwest side of the Verdugo Mountains. 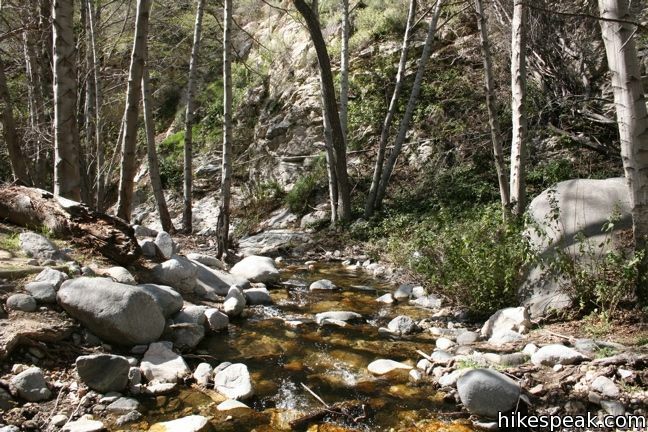 This 5.33-mile round trip hike in Placerita Canyon Natural Area follows Canyon Trail to the ruins of Walker Ranch and Waterfall Trail to an elusive falls in a sylvan canyon. 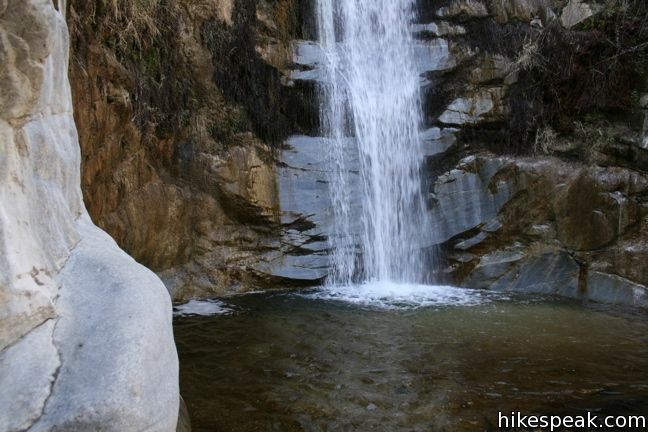 This 3.5-mile hike goes up Eaton Wash to a narrow stretch of Eaton Canyon containing a pleasant 40-foot waterfall. 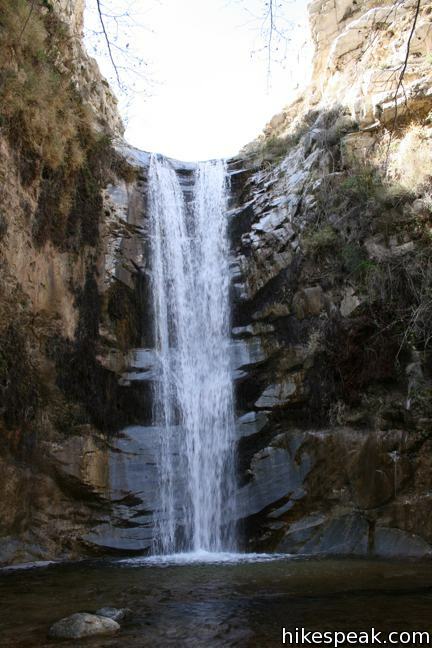 This 40-foot waterfall is located within Wildwood Park in Thousand Oaks and is reachable via several trails. This 3.8-mile out and back hike visits a 200-foot waterfall that is split into two tiers. The upper tier is 150 feet tall and stunning after a rainstorm. I was following up on this posting and seeking out an Adventure Pass. According to the USDA Forest Service this trail is Free and does NOT require the pass. The site mentions recent changes so maybe this has become free after posting. 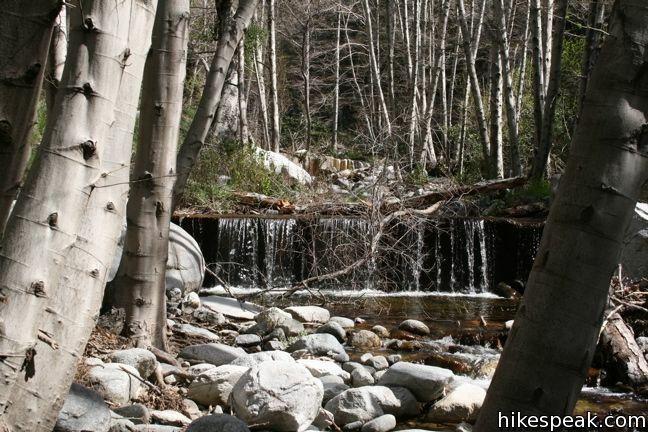 NOTE: While the Trail Canyon area of the Angeles National Forest reopened to the public in 2012, there is a large wash-out along the trail and other damaged from the 2009 Station Fire that has made it difficult to reach the waterfall. Yes, it is very difficult to reach the falls. This will not change, as the trail is not maintained. Half way to the falls, the trail begins switch-backing up the left-hand side of the canyon. This stretch of the trail is impassible, without running the risk of falling into the abyss. It is extremely dangerously narrow, and should you trip, there is nothing to break your fall. I accessed the falls yesterday through an alternative route: I resorted to traveling off of designated trails. I literally scrambled along the side of the stream, and in some cases in the stream, to the base of the waterfall. It was fairly difficult scrambling and bush-whacking, because there is no clear path there. There are too many thickets. I got scratched all over the place. It was worth it though. The falls were quite a spectacle. There was a moderate amount of water, considerably less than the pictures above. It was still very pretty. Should you attempt this scrambling/bushwhacking, be very careful about tripping on slabs of rocks along the stream if you get your boots wet in the stream, as I did. I tripped a few times, but I was not quite as careful as I would have been if I had more daylight. Allow at least four hours before the gate closes. can you please confirm or deny if a adventure pass will be necessary in June. We plan to come with our Cub Scout pack and need the details to prepare all in advance. Parking fee? and or pass necessary ? According to the national forest, this is now a free trailhead and no adventure pass is required. 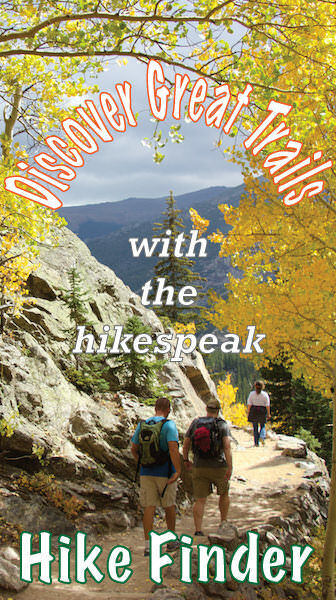 Has anyone done the hike recently? Is the fall still visible? Saw a yelp posting from 2 weeks ago and poster said there was no fall. I hiked it today 7 – 26 – 2013 no-falls. We haven’t had any rain in like 4 or 5 months. You have to go in winter if you wanna see some big time falls! The trail is washed out in like 7 or 8 places watch your footing on this trail please. No falls, but there should be water in the creek still, correct? On May 3, 2014, I hiked to the fall. The first 0.5 miles appear to be treacherous due to fallen trees, crossing streams, etc. After that the trail seem to be more well defined and normal. The only thing is that you need to scramble to get to the canyon floor to enjoy the fall from the bottom. It looked really steep, so I passed andto decided to stay at the top area of the fall – ample fresh and clean water to enjoy. The hike up to the falls is awesome and worth the trek. The trail will take you all the way to Tom Lucas Camp and Condor Peak. This is no easy stroll in the park and make sure you take the 10 essentials.Check out my video for Trail Canyon Falls and some other videos that I posted of my adventures. I hiked this trail yesterday. The falls are completely dry. Hiking to the falls seemed fairly easy. Getting there is a good bit of uphill though (although never that harsh). I hiked at least twice the distance past the falls until the trail petered off into the brush and was too overgrown. It’s worth hiking past the falls (dry or not) for a while. Never did it seem treacherous. 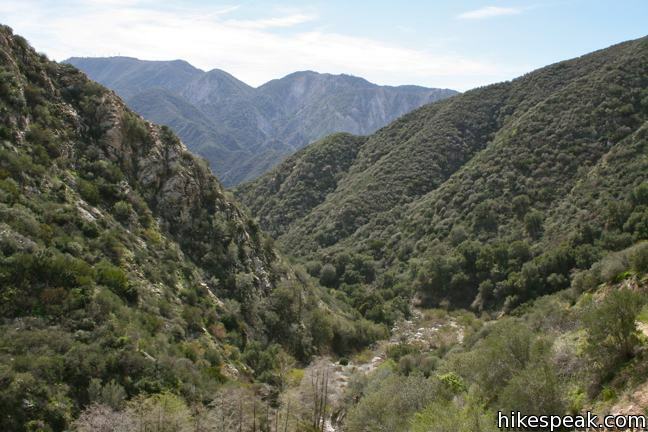 This trail really does have all the beautiful aspects of hiking in Angeles National Forest… desert-like rocky areas, lush green ravines where water flows, shade and tall trees, sunny open mountains, panoramic 360 views, blooming flowers (seemingly year round). It’s a pretty trail, flowing falls or not. I brought a liter of water and hiked for about 4 hours or so (2 hours in, 2 hours out). The trail gets a little hard to spot at points but with just a little looking around you will find it again, it’s hard to miss, for the most part it is always running creek-side. People put up markers and cairns to make it easier. But it could use another round of tidying past the falls. I want to know how far it actually goes! I went to the falls in early February and the waterfall is present. Not quite to the degree that we see in the pictures above, but still present. its may of 2016 Anybody been here recently? Is the waterfall accesible? Is there still water flowing?? 7/23/17 I was there this Sunday and we hiked two miles, but there’s was no waterfall,but somebody told me it’s almost a total of 10 miles round trip is that true? I’m kind of confused here! The 10-mile distance could be for a hike going farther up Trail Canyon Trail. The waterfall is a couple miles up, but can be dry and hard to see in summer months. Anyone hike this recently? Still free to park? Any water? Thx! Lots of water from all the rain! You need to cross streams several times. Didn’t go down to the waterfall, but could see it from the top of the trail towards the end. We just parked at the entrance and it was free. I’ve done this trail a few times and really enjoy it. I’m wondering if anyone has tried making it to the waterfall walking through the canyon floor? Essentially continuing on the canyon floor instead of taking the switch-backs up the left-hand side of the canyon.